Playtowin — Slots, Casino, Dice, Etheroll - Try You Luck! Slots, Casino, Dice, Etheroll - Try You Luck! 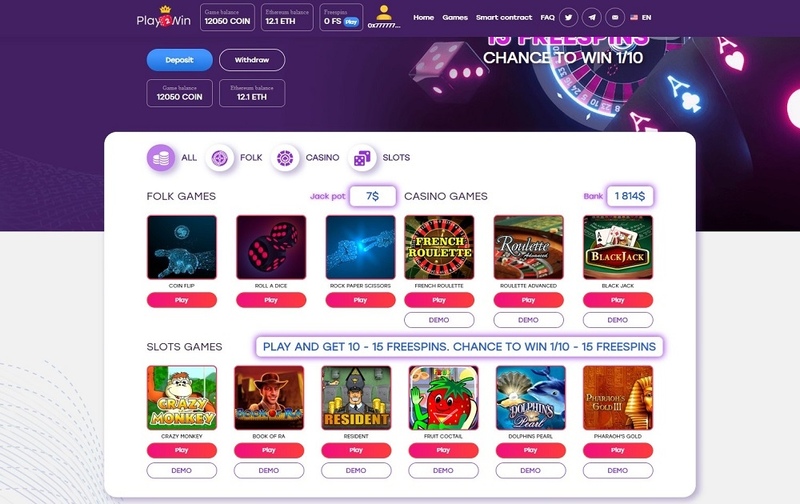 Gaming platform, Play2Win consists of four sections - Folk games, Slots, Casino, and tournaments of Classic games between the players. In each section you will find lots of interesting games. For playing Play2Win you need MetaMask or Trust(in mobile version). After selecting the desired game bet and play. If you win, a Smart contract will give you the winning to the purse from which rate. Commission gaming platform has the lowest percentage, have a question? - read the FAQ Play and win. Try your luck. Win A Jackpot.